range ⋆ 100% Private Proxies - Fast, Anonymous, Quality, Unlimited USA Private Proxy! Kerberos replay attack within allowed range – authenticator won’t prevent it? In kerberos protocol the client, after receiving a ticket to the TGS server, sends a request to the TGS and adds an authenticator to the request. What if an attacker performs a replay attack within the allowed clock skew, so that the difference between the timestamp in the authenticator the attacker copied and the TGS’s clock is still allowed. What kind of check will the TGS perform in such a case ? If the clock skew is 5 minutes then shouldn’t there be some cache memory holding all requests from the last 5 minutes so that if the same authenticator arrives again TGS will reject it since the same timestamp already exists in its cache ? (because a valid client sending a second request would generate a new timestamp while an attacker will use an existing timestamp) ? Is there such a cache for the case of a replay attack within the allowed time range ? I have a survey that sends responses into a Google Sheet. The raw data that is inserted is messy, so I have another sheet that processes the incoming raw data. One of the things I need to do is: from a range of columns in one row, pull the non-empty cells–and do this automatically with every new response that comes in. Because the survey will insert rows, it ends up adjusting any cell references in my ‘Processed Data’ sheet, so I’ve been trying to use ARRAYFORMULA unsuccessfully. Also, the range of columns will be more than 400 (options of schools), so manually writing out individual column names would probably be unfeasible. Background: In the survey, a respondent can select multiple schools to a maximum of 8 out of a selection of 400+ schools. In the ‘Raw Data’ sheet, each school option is represented by a column. Hopefully all of that made sense. Any help would be greatly greatly appreciated–I’ve been stuck on this for a while! Is it possible to configure Netplan with Static IP range? Or do you need to specify each IP like in old ifupdown configuration. Would I need to just specify each IP like bellow or is there a simpler way to specify a range? Can you auto update the range for a filter in Google Sheets? I have a Google Sheet document with many rows in it. I have several filters set up to view different collections of rows. The problem is, this sheet has new rows automatically added to it several times a day from automated external sources. So, whenever someone goes to view one of the filters, it is no longer filtering all rows, as the range for the filter does not include the rows added to the sheet since the last set. Is there a way to have this range automatically update the end of the range to be the “last” row of the sheet? Let $ n$ be a positive integer. Is it true that for all $ 1\leq i \leq n$ there exists a length $ n$ binary string $ w$ such that $ K(w) = i$ . Where $ K(w)$ is the Kolmogorov complexity of $ w$ . For each $ i$ there are clearly $ 2^i$ programs of that length. But can we be sure at least one of them (when executed) generate a length $ n$ binary string? It is 3 SUMIFs all using the same criteria and sum range, the criteria uses 3 cells all in the same range. Is there a way to achieve this ? perhaps even with SUMPRODUCT ? Also, in place of the range E1:E3 I would like to use a named range, if possible, If not just a way of condensing the multiple SUMIFs will do for me. I’ve come across plenty of formulas to find blank cells within a certain specified range, but can’t seem to figure this out / find an answer. Where column A is empty except for these header bars, and there are lots of sections going down the sheet with these header bars. 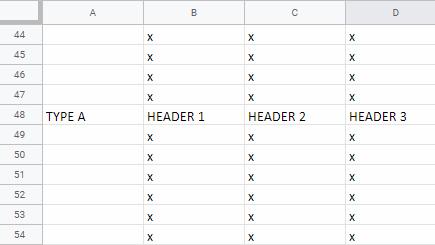 What I’m trying to do is have a formula that can find the row of the cell A header from within a section, but so that the formula will work in any section. So in the above “sheet”, let’s say I was in cell B52. Maybe there’s a formula to look at A52, and if empty keep moving up until it found that cell A48 was the first cell upwards to have a value, and return the value as 48 (the row). I’m also hoping this can be done with regular formulas and avoid using gss if possible so it can remain dynamic. I’m hoping for a formula that when placed in cell B32 as highlighted, it will return A28, or just 28, as in the row of the previous non-blank cell, but then ideally, the same formula could then be placed anywhere else, say for example B46, which would then return A37 as the previous non-blank cell in the A column.